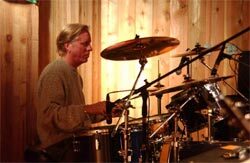 For over thirty years, Jamie Oldaker has built a career in the music industry as one of the most respected drummers and producers. Born and raised in Tulsa, Oklahoma, Oldaker was influenced by a number of musicians at a young age to become a drummer. His career began straight out of high school, joining Bob Seger's band to tour and record Back in '72 , while playing the local scene in Tulsa . Singer/songwriter JJ Cale, who was signed to Leon Russell's newly formed Shelter Records, hired Jamie as a session musician. He played with The Gap Band, Georgie Fame and many others. It was during this time that some of Jamie's live recordings found their way to Eric Clapton who eventually hired Jamie to join him in the studio. 461 Ocean Blvd., Slowhand, There's One in Every Crowd, EC was Here, and Backless are among the albums that Oldaker recorded with Clapton. Between touring with Clapton and Seger, Oldaker found time to record two albums with blues artist Freddie King. Shortly thereafter, Peter Frampton offered him the opportunity to play on his tour. Oldaker joined him immediately after the conclusion of Clapton's tour. He recorded with Frampton on Where I Should Be, which reached gold status, and later recorded with the Bee Gees and Phil Collins. Around this time, Jamie discovered Ronnie Dunn (of Brooks and Dunn fame). Oldaker continued to tour with various artists including Stephen Stills, Frampton and Dave Edmunds. As a member of The Tractors, he sold over 3.5 million albums. Currently, Oldaker is producing Willis Alan Ramsey's new album in Texas . He is also producing a project featuring Eric Clapton, Vince Gill, Ronnie Dunn, Willis Alan Ramsey, Taj Mahal, Peter Frampton, Bonnie Bramlett, Ray Benson, JJ Cale, Willie Nelson and many others. The album, titled Mad Dogs& Okies, will be released in the late Summer of 2005 on Concord Records. For more information on Jamie Oldaker, please visit his website at www.jamieoldaker.com.